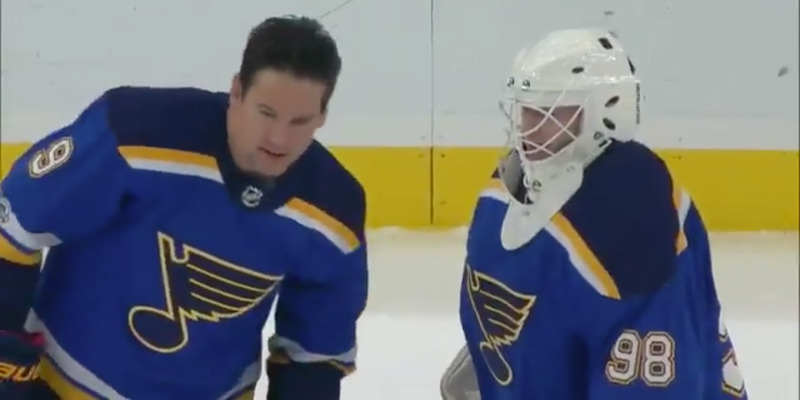 The St. Louis Blues were in need of a backup goalie on Thursday night after Carter Hutton was hurt during the team’s morning skate. Tyler Stewart, a Blues season-ticket holder who brings his pads to every game in case his services are needed, got the call on Thursday afternoon after finishing his shift filling vending machines. Stewart got to warm up with the team and got a jersey for his efforts, before heading back to his seats once the Blues’ official backup had arrived. Tyler Stewart got to live his NHL dream for a night after the St. Louis Blues realised they were in need of a backup goalie on Thursday. After finishing his shift as a vending machine worker, Stewart got the call on Thursday afternoon that the Blues needed an extra netminder after backup Carter Hutton injured himself during the team’s morning skate. Blues AHL goalie Ville Husso was called up from San Antonio, but would not be able to make it time for the night’s game to start, leading the team to call in Stewart to sign a tryout contract and go through warmups with his favourite team. A Blues season ticket holder, Stewart described the night as a dream come true. Stewart, who played throughout college and still tends the net in an adult league, had skated with the team before, and told The Athletic that he brings his pads to every game just in case they need him. With five minutes left in the first period, Husso arrived from San Antonio and Stewart went back to his seats in section 313, but still left with a night he’ll never forget. You can watch an interview with Stewart on his whirlwind night below.